FairLifts schedules a variety of aerial spraying services that will enhance the overall health of your land. Crop dusting, brush and weed control, frost treatment, and mosquito and pest control are all services that coordinate for our clients. Helicopters allow for a faster and more efficient method of caring for land than traditional ground cranes. Contact FairLifts to learn more about premium aerial application options. West Virginia is a beautiful, boundless state with tons of natural land. West Virginia is home to the Appalachian range that includes mountains such as the Shenandoah, Castle, and Great North Mountains.The Monongahela National Park covers about one million acres of land alone. Helicopters make navigating the Mountain State more convenient than ever, completing cropland application will no longer be a hassle. Ground cranes are not able to reach inaccessible areas making it difficult to complete jobs. Helicopters provide a solution for transporting goods, and maintaining large farms. 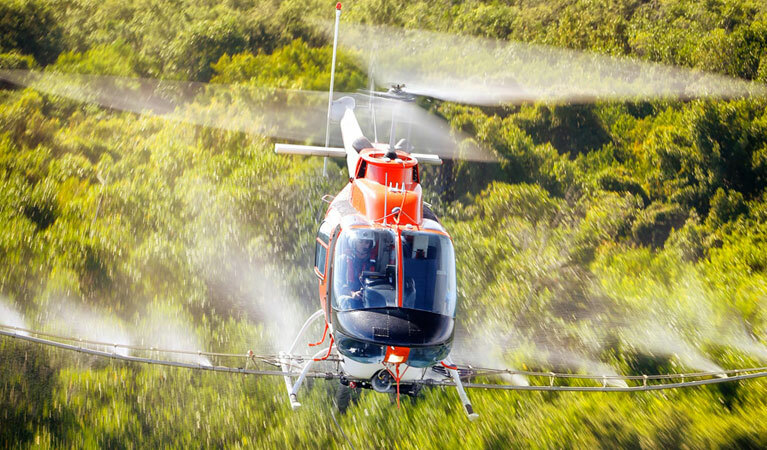 We schedule a variety of helicopter spraying services; including fungicide, fertilizer, watering, and seed spraying. Helicopters can reach hard to reach areas and provide thorough application. Local operator’s vast fleet of aircraft is guaranteed to surpass all of your needs. Crop dusting is a necessary maintenance to upkeep healthy land. Harmful chemicals, dust, and diseases are detrimental to the well-being of crops and risk the health of your land. Take the extra step to protect your farm from hazardous contamination and conditions. Large farms and natural areas are highly susceptible to pests and mosquitos throughout the year. Mosquitoes, larvae, and fungi are extremely damaging to farmland. There are several other insects and small animals that can eat through your fresh crops and spread bacteria or viruses through your product. Pests risk your crops which can cause you tons of money. Disease-carrying insects also threaten the health of farm animals and human life. Pesticide and fungicide aerial application is the most efficient method of preventing pests in large areas. Helicopter spraying is a vital process for maintaining your farm and farm life. Weeds are detrimental to the health of surrounding organisms. They cause growth and health imbalances with other wildlife. Weeds do not produce medicine or food essentially existing as overall harmful plants. Once they begin growing they self regenerate, spreading seeds at accelerated rates. Crops are in constant competition with weeds for sunlight, nutrients, and space. This results in discoloration, dysfunctional growth, and increases chances of disease. Vendor’s professionals choose the most effective herbicide to meet your needs. FairLifts reserves frost prevention and treatment to sustain your product throughout the season changes. Harsh fall and winter temperatures can lead to the deterioration of your crops health and can cause them to wither. This can leave farmers feeling defenseless against the grueling weather. FairLifts has a solution. Habitual aerial application can prevent crops from freezing and protect them throughout the colder months. Local flight professionals are happy to provide you with a comprehensive treatment plan with recurring helicopter sprayings. Contact FairLifts to reserve your helicopter today. Our customer support team is available to provide more information if you have any additional questions. Contact us at 1-800-318-8940 or complete the form below and our team will respond in less than 24 hours.